Action Public affection is waning for the Superhero Relocation Program overseen by Rick Dicker, which would render Bob Parr aka Mr Incredible, wife Helen aka Elastigirl and their children Violet, Dash and Jack-Jack obsolete. A masked menace called Screenslaver emerges from the shadows and threatens the safety of the metropolis. Elastigirl races into the melee, flanked by a motley crew of superhero wannabes comprising Krushauer, HeLectrix, Reflux, Voyd, Brick and Screech. 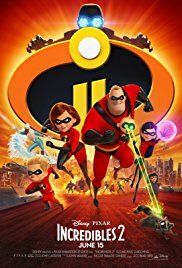 Incredibles 2 is not currently showing anywhere.